Normally computers speed up calculations. But with his new pen-and-paper formula Kevin Heng of the University of Bern, Switzerland, gets his results thousands of times faster than using conventional computer codes. The astrophysicist calculates the abundances of molecules (known as atmospheric chemistry) in exoplanetary atmospheres. Ultimately, deciphering the abundances of molecules allows us to interpret if features in a spectrum are due to physics, geology or biology. 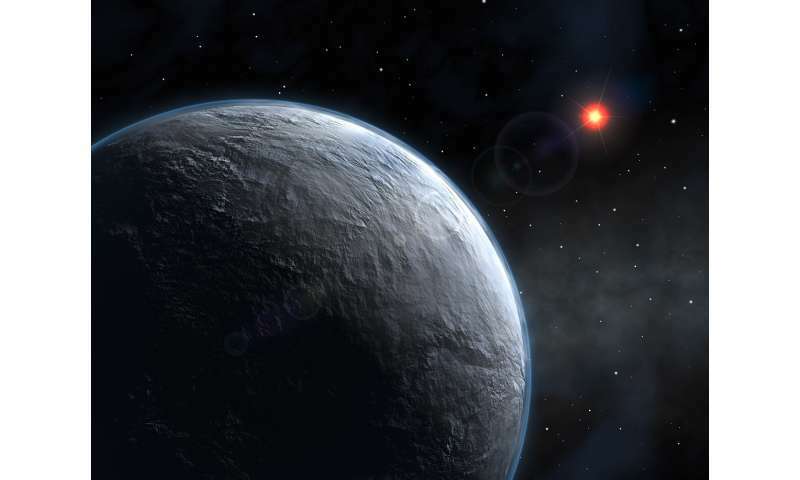 With their sophisticated instruments, astronomers today not only detect new exoplanets outside our solar system but are able to characterize the atmospheres of some of these distant worlds. To know what to anticipate and when to be surprised theorists calculate the expected abundances of molecules. Kevin Heng, director of the Center of Space and Habitability (CSH) at the University of Bern, is an expert in these calculations. "The sun – and other stars – have a very definite proportion of chemical elements like hydrogen, carbon, oxygen or nitrogen", he explains: "And there is a lot of evidence that planets form from the essence of stars." But whereas in stars the elements exist as atoms, in the lower temperatures of exoplanetary atmospheres they form different molecules according to temperature and pressure. At low temperatures, for instance, the dominant carrier of carbon is methane (CH4), at high temperatures it is carbon monoxide (CO). The network of possible chemical reactions is well known but very large. Therefore, conventional calculations are complex and very time-consuming. "I found a way to do this much faster by solving 99% of the problem on paper, before one even touches a computer," says Kevin Heng. "Normally, one solves what we call a system of coupled, non-linear equations. I managed to reduce the problem to solving a single polynomial equation. Effectively, I 'uncoupled' the system of equations on paper, instead of using a computer." Solving this polynomial equation then takes a fraction of the original computer time. "It took me a few months to figure out what is possible", says the astrophysicist. He needed two papers to lay down the foundation for the main result in the third paper that is now accepted for publication in the Astrophysical Journal. "This breakthrough essentially reduces the main part of the program to one line of computer code. Now we can calculate chemistry in 0.01 seconds (10 milli-seconds) instead of a few minutes." A figure showing curves of the relative abundances of various molecules like methane, carbon monoxide, water or ammonium versus temperature demonstrates how accurate the new formula is. "You can almost not tell the difference between my calculations and those with the complicated computer code," summarizes the scientist. No wonder the paper caused a stir in the experts' community even before its official publication. The new analytical method has several implications. The tremendous speed-up allows for a more thorough exploration of the possibilities when interpreting the spectra of exoplanetary atmospheres. To Heng, what is more exciting is the opportunity for scientific democracy: "It is now easy for any astronomer, around the world, to calculate atmospheric chemistry in exoplanets. One no longer needs to implement a sophisticated computer code. I get a kick out of knowing that this knowledge is instantly transferrable to any other scientist in the world." Observing the atmospheres of exoplanets, scientists hope to find out how the objects formed and what kind of processes are still taking place. Atmospheric chemistry teaches them how and when to be surprised. Differences between the calculated and the observed abundances of molecules could unveil geological or even biological processes. "Maybe in 20 or 30 years looking at an exoplanetary atmosphere with water, oxygen, ozone and other molecules we can ask whether we see life," says Kevin Heng: "But first we will have to answer the question whether the data can be explained by physics or geology." We are a mess of star stuff. nine gasses are the nodes. to compute it all again.